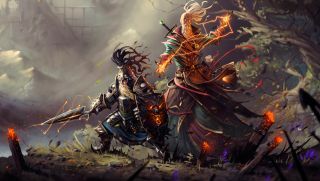 Divinity: Original Sin 2 officially launched its Kickstarter campaign today, which aims to increase the already dizzying amount of choice and variance in the game through crowd-funding. Along with a large host of improvements and changes to the first Original Sin, Larian Studios announced the sequel would be playable with up to four players and feature a competitive mode, accessible both in and out of the story mode. I got a chance to play a pre-alpha build of Divinity: Original Sin 2 head-to-head against Larian's Creative Director and CEO, Swen Vincke. It was a rather intimidating affair playing against the man who founded Larian, but I put 80 hours into the first Original Sin and was ready to put up a fight. We each took control of two members of our four character party and jumped into a dungeon-themed arena—packed with neutral NPC skeletons and a valuable chest in the center of the battlefield. You can watch the video above to see exactly how it went from there. The fight played out like any other might; we each took our turns trying to out-maneuver our opponent's and the plentiful elemental hazards around the map. But this was the first time I'd ever fought another living person with Original Sin's finely tuned RPG systems, and I found myself no longer able to rely on the enemy making predictable mistakes. The skeletons were still AI-controlled (and caused a large amount of chaos during the battle) but I could only win when my opponent's characters were dead, not by killing more skeletons than him. Vincke mentions in the video above that this isn't the only arena level available, even saying they've been internally testing a "Gauntlet"-style competitive dungeon crawl. Divinty: Original Sin 2 will also have a editor available, meaning players can make their own arenas to compete against each other in. It probably won't be what the majority of players spend their time on, but competitive multiplayer in the Divinity engine has got me very excited. You can watch our longer playthrough of the Divinity: Original Sin 2 pre-alpha with Vincke right here.